Well, that year flew past, didn’t it.? It seems like only yesterday that it was 2017... and now it’s 2019. The first year of Hwyl being my primary focus was a whirlwind of highs and lows. We got close, but ultimately not close enough to get fully up and running. So over the last couple of months while eating too much turkey and enjoying too much wine, I went back and revisited what happened and asked myself some important questions: What can I change over the next 12 months to make Hwyl a no-brainer for the performance car enthusiast? What can I do to make it better for you and improve the launch approach? I thought we had some great events last year. The watch evening was a great success, as was the Airstream at Cars and Coffee. I would love to keep events happening in 2019. I had a lot of fun dipping my toe into podcasting last year. I’ll be improving that this year, and launching several new designs for shirts and prints as Hwyl gets deeper into 2019. 2019 will be a year of extended networking and connecting with people with the same interests. Performance cars are more popular than ever and there are new exciting models being released all the time. Tapping into that enthusiasm is important. But, I are going to change it up a little. My goal for 2018 was to get enough folks together to get the space up and running and get cars on the streets. In 2019, I’m changing the approach to look at getting the cars on the road as soon as possible, and changing the target first cars. With 4 charter members signed, Hwyl gets our first car: the new Aston Martin Vantage, the most beautiful looking new car on the road in my opinion. With 3 more charter/regular members, we get our next car: the McLaren 570S. With 3 more charter/regular members, we start the clubhouse process and add our third car: AMG GT. I’m also updating the referral option. If you refer someone and they join, seems only fair that you get to drive one of the cars too. It makes more sense to get the cars on the road, and get people involved in what we are doing with other media. The clubhouse will be a huge part of the club as Hwyl matures, but to start with, let’s get on the road and enjoy these cars. Being able to join and drive straight away will be a much different proposition to increase membership immediately. 2019 will be a watershed year for Hwyl. I hope those of you who have signed up to receive our communications and are thinking about joining will reach out and sign up. It won’t take long before you are driving the Vantage. Check out the details on the Charter Member page and reach out. As the 6 Nations rugby approaches and Wales are again contenders for the championship, the feeling is resonating around Wales. It’s all about the passion. The Hwyl. I hope everyone reading this is off to a great start to 2019 and I am as invested as ever in making Hwyl Auto Club a fixture of the performance car industry. I just love these things…. Let us know what you think the next resto mod special should be…..
We catch up with @roadscholars1 (Insta) amazing result at Pebble Beach and the rise of the Hyper Car market and the incredible cars in that sector. Another installment of Perfformiad, our almost regular podcast on things in the performance car universe and at Hwyl. This week, Tim does a deep dive on Aston Martin, his favorite car company and one with a couple of Welsh connections. Check out the Charter member packages discussed, plus the Apparel section. This week, Tim talks about the preponderance of preposterous large barge luxury SUV’s and give an update on the latest events at Hwyl Auto Club. Leave your comments below on whether Tim is just an old curmudgeon or if you agree. Podcast Episode 1 - What is a Performance Car Lifestyle Club? Welcome to Perfformiad, the new podcast from the Hwyl Auto Club. Join Tim as he talks about the latest news in the world of performance cars and several other things that are on his mind. Our first episode dives into what is a Performance Car Lifestyle Club. What is a performance car lifestyle club and why should you join? North Carolina has been my home since moving from Wales in the early 90s, and I wanted to connect Wales and NC in some way to celebrate this personal connection. NC has a long history of performance driving starting with the moonshine runners and Wales has a history of rally driving, so taking that as our connection, we are pleased to announce our first apparel collection under the heading of #NCymru, an amalgamation of NC and Cymru (Welsh for Wales) in a collaboration with NC artist and designer, Brittain Peck. With this series of shirts, we wanted to celebrate our home away from home, and its passion for performance. The details we selected to represent this are taken from the heritage of NASCAR and seem like a little thing, but when I visited the Hall of Fame, I was struck by this detail on all the older cars. All the older cars have their engine sizes painted on the hood and I wondered why. The number started as a boast. In the early 50s, it was sort of an arms race and each driver proudly displayed their engine capacity or horsepower on their cars. In the mid 60’s there were differing NASCAR weight rules based on engine sizes; the weight regulations for a 390 Ford might be different than a 426 Hemi. For example, Richard Petty might use a 404 CI in some races, and a 426 CI in others, based on the track they were racing at. The hood was their declaration of their engine size. In the early 70’s, with the oil crisis, rules changed to limit engine sizes and power, and 1973 was the last year these numbers appeared as part of the livery on the cars. The shirt design focuses on this detail, linking our passion for detail, taste and performance to our home, now in NC, directly. We sat down with Josh from Rawautos.com a couple of weeks ago to talk about Hwyl, and we cut together some of the answers to give you more insight into Hwyl and where we want to take it. I also love that the thumbnail looks like I am singing. For your own personal protection, I guarantee you that isn't happening. Hope you enjoy it and learn something new about us. These events are very dependent on the calendar of everyone who RSVP’d, so I decided to add a degree of difficulty to this one by scheduling it on the same day as the Duke-Carolina game. You would think after 25 years in the area, that would have registered with me for possibly the most hyped college basketball game of the year. Even with that scheduling snafu, we had a great turnout at Taggart Cars on Thursday evening. The team from ECJ Luxe Collection in Charlotte arrived with a veritable smorgasbord of amazing watches for us to look at, in addition to the great showroom full of cars from Taggart Cars and a few beauties in the parking lot that some of our attendees brought, including a couple of Bentleys. Food from La Farm bakery and wine from our regulars at The WineFeed rounded out the catering side of things, but with all due respect to them, the stars of the evening were from ECJ Luxe. Ross Gallin did an amazing job explaining the watches to all that wanted to look, and there were some beautiful ones from Hublot, Blancpain and Audemars Piguet and from a couple of manufacturers I hadn’t discovered yet. Thanks for the great goodie bag too. It was worth coming for that. Taggart also had some gorgeous cars on display including a matte grey Audi RS7, BMW Z8, BMW M4 (Blacked out) and several Caymans. Another great evening. Thank you to everyone that came, faces old and new. To the new faces, let me know if you need any additional information. We would love to have you as a part of the group. Keep your eyes open for the next event coming up in March/April timeframe. Hope everyone had a safe and happy Christmas break. It’s been quite a first year for Hwyl as we breathed life into this concept we’ve been kicking around for over 8 years. Thank you to all those who have attended one of our events, looked at our site or social feed and have shown faith in us as we get Hwyl moving. The reason we picked Hwyl as the name for the company was the very definition of the word; the passion generated by a group of like minded people. We want to create a community of people who enjoy performance cars and the lifestyle surrounding them. 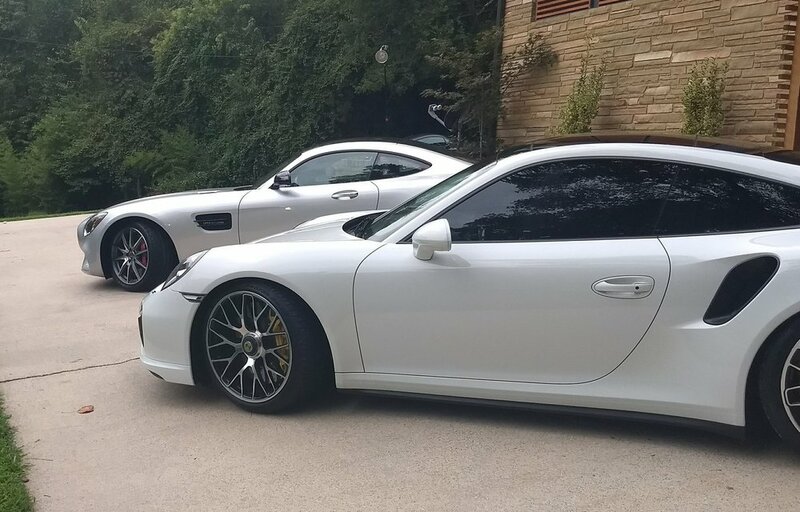 Hwyl's goals are to satisfy all types of performance car enthusiasts from consumers of web content to personal one-on-one driver training or advice on starting a collection. We have big plans and the progress we made in 2017 was the first rung on the ladder. It’s only been 6 months since our kick off event at Bare Bones in Raleigh in June, but that feels like yesterday. We had a amazing line of cars outside and some great food and drink. It was a treat to be able to finally reveal all the thinking behind Hwyl, and meet some wonderful new friends. There's a more detailed review in the blog you can read by clicking here if you wish. We decided to try something a little different for our next event, and went with a theme. Leidenschaft (Hwyl in German) was a celebration of German cars, food and wine we held at a member's house in Chapel Hill in late August. This was a more intimate affair and provided the opportunity to spend more time in and around the cars. You can read more about this event here. The concept worked so well that we repeated it, on a larger scale, with an Italian themed evening, Passione (Hwyl in Italian) at a gorgeous house in Chapel Hill in October. Again, with some beautiful cars from Ferrari, Lamborghini and Alfa Romeo and accompanied by regional food and wine. You can read more about this event here. We had over 50 folks in attendance for this one. The goal of these events was to generate awareness for Hwyl and to showcase the types of events that members can expect when they join. We will be doing several more of them in the coming year. Charter membership interest has grown, deposits were taken and we are very close to our target number for launch. So close, that we are opening up reservations for regular memberships, starting in January, to accelerate our launch. 2018 will be a big year. I’ll be sending out another update in the next week letting you know all the changes and events that are coming in 2018. Nadolig Llawen a Blwyddyn Newydd Dda from all of us at Hwyl. There are certain benefits of living in this area of NC. One of them is the amazing Fall weather. Friday night turned out to be one of those perfect evenings, and with the help of some old and new friends, we had a fantastic evening at Governor’s Club for "Passione", a celebration of Italian performance cars. Together with Governor’s Club Realty, we hosted "Passione" at a beautiful Italian style villa at Governor’s Club in Chapel Hill. 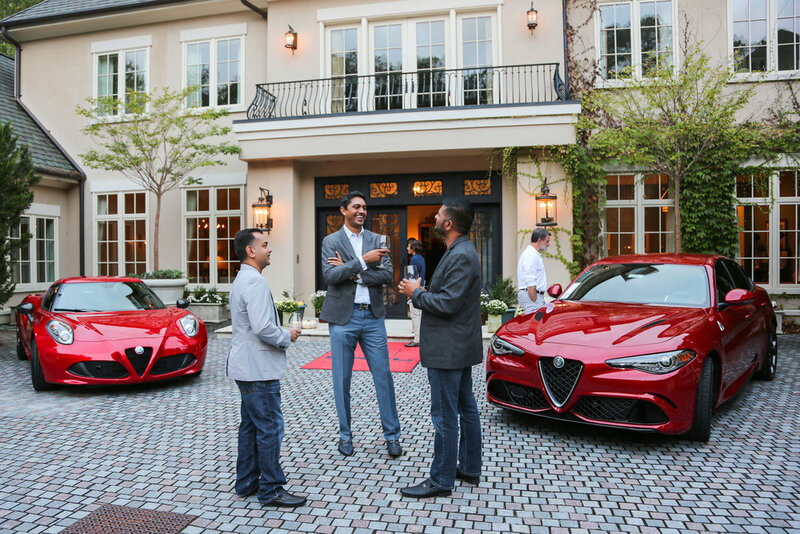 In the courtyard of the house, we had a selection of the finest Italian performance cars for our guests to look at from Alfa Romeo, Ferrari, and Lamborghini. The Alfa Romeo 4C and Giulia Quadrifoglio were big hits. It’s always fun to explain the history and heritage of this amazing brand and show them these new incarnations of the cars. Enzo Ferrari himself used to race for Alfa Romeo, so they have been around a long time. Several folks also didn’t realize that Lamborghini was a tractor manufacturer who only started making performance cars because of a difference of opinion with Enzo as well. Lots of drama in the history of these car brands. The Lamborghini Huracan in a metallic yellow was gorgeous and got everyone’s attention, and the lovely Ferrari California rounded out a solid foursome of Italy’s finest cars. Many photos, selfies and long conversations about lines, power, design, and stories of previous old cars were had while looking at these wonderful things. 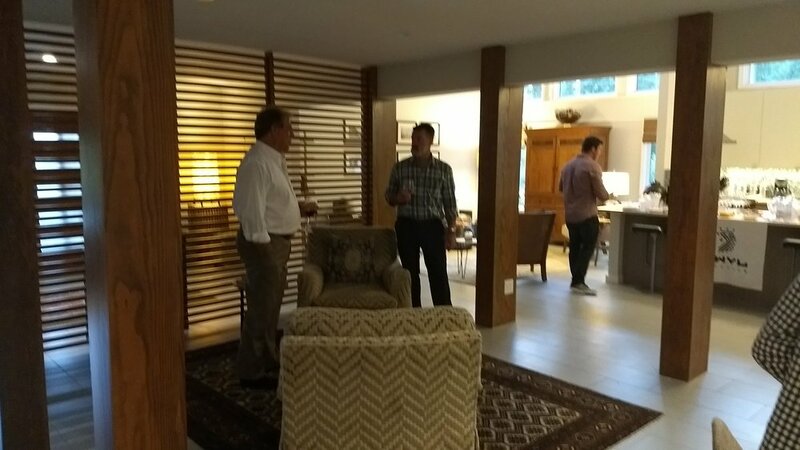 Inside the beautiful house, our friends enjoyed great food from Tarantini, some Social House Vodka and a selection of hand-picked Italian wines from our friends at the Wine Feed while enjoying the amazing view of the golf course as the sunset. The picturesque location, with a beautiful view of the golf course, marble floors and stylish accents was a perfect place to complete the ambiance of the event. Thank you to all our friends who came out to join us, even if just for a few minutes, and I hope you enjoyed the event as much as we did, and especially thanks to Alfa Romeo of Cary, The Wine Feed of Raleigh and Tarantini. We’ll have to see what the next one will look like…. We’re open to suggestions, but it might be time for the cars from my homeland to make an appearance. The theme was Leidenschaft, which is the approximate German translation of Hwyl. It means passion, and we wanted, for this inaugural monthly event, to celebrate German performance cars. This area has a deep love and technical knowledge of Porsche, with our friends at Road Scholars (who recently won their class at Pebble Beach (that’s a REALLY big deal)), the Porsche Club of America having very strong membership in this area, and being the home of one of the world’s best private Porsche collections, it seemed appropriate to start with German cars. We held the event at the home of one of our members and the cool mid century modern house provided the perfect backdrop for the cars in the large circular driveway. Inside the house, in addition to the food and wine, we had some rare Porsche models and books for our guests to skim and enjoy. The Singer book, and the rare Le Mans book were just a taste of what our clubhouse will contain, and highlights our deep passion for these incredible cars. The Lego GT3 RS was a hit. If you haven’t seen one of these yet, you really should. The engineering that has gone into making that is quite amazing. It was great to hear common experiences shared about trips to Monaco, other grand prix and other cars that the guests had driven. Fortunately, the earlier rain held off and we had a rare cooler day in NC in August to take our time looking at the cars and talking about them. Looking for the areas you like, listening to them idle and rev, as well as just stepping back and taking them in. The Germans do make some beautiful cars. It was interesting to see the differences and similarities between the AMG GT and the Porsche Turbo S. Hard to pick a winner out of them. It was just the visual differences. Cranking up the AMG and opening the exhaust baffle made for a great V8 noise to make the neighborhood wonder what the heck we were doing. The Porsche wasn’t quite as loud, but you could feel the power in the noise generated from that flat 6. This casual and relaxed setting made for a great evening. Connecting with the cars, sharing the experience and meeting new people is the essence of what Hwyl is about. We will be doing more of these types of event in the future, and we look forward to having more cars, and new faces as we grow. I’m already thinking about a similar event for Italian cars in the future. A huge thank you to our host for the evening (who designed the house), the folks at Winefeed for the great wine, and the German Grille for the food. Those potato pancakes and brats were fantastic. Another event in the books, and another being organized for the near future. As we near the launch of Hwyl Auto Club, we are pleased to announce the addition of another benefit for our members. During conversations with charter members and prospects, many people brought this up as something that they thought would be a tremendous addition to Hwyl. After looking at the amount of space we need, and running the numbers, this option is really a no-brainer, so we are adding Storage at our facility for our members. Members can store vehicles at the facility for $350 per month per car, with no contracts and no minimum terms. Charter members get even more favorable pricing. Going on vacation and want to make sure your cars are well looked after? Let us take care of them for you. Want to buy that new exotic, but don’t have the space? Now you do. Each car gets a custom car cover, a maintenance schedule and it'll ready for you when you want to pick it up. Detailed and ready to go. Just let us know when you want it, and we'll do the rest. We’re really excited to add this for you and hope to see your cars as well as our own at the Hwyl Auto Club. We had a great night at Bare Bones on Thursday June 8th for the Hwyl Auto Club evening. The weather was amazing. Not too warm with a breeze keeping the temperature down, but just outside the restaurant, the temperature was just a little higher. For the first meeting, we assembled a really hot collection of high quality horsepower along our reserved block of Fayetteville Street. Heads turned up and down Fayetteville Street as each car arrived. The noise of the engines over the regular traffic got your attention at first, and then the first glimpse of the shapes really pulled you in. I loved the look of the 570 GT peering around the UPS truck in front of it as it drove up towards the restaurant. There are lots of pictures all around Raleigh as people pulled out their phones and snapped away. I think the staff were getting a kick out of it as well. We ended up with a great line up. Starting from the front, we had a beautiful lava orange Porsche 911 GT3 RS, a black Rolls Royce Ghost, a white Ferrari 458 Spyder, a pearl white McLaren 570GT, a black Dodge Viper, a rosso Ferrari F12 and a gun metallic Nissan GTR. An amazing collection of machines. Upstairs in the restaurant, invitees met new and old friends alike in the private room, while a backdrop of performance car images changed behind them on the big screen. Everyone looked to be enjoying the complimentary bar and great appetizers. Those sliders though…. Damn, they were good. I talked to the group for about 15 minutes about the Hwyl concept, where it came from and what they can look forward to as a member of Hwyl. The feedback we got was really awesome, and we’re happy that the idea resonated with those in attendance. While popping downstairs to check on the cars, I got stopped several times by some of the restaurant customers to ask what was going on, and the head turning line up outside really did the job of attracting interest. One lady with a thick Irish accent thought the whole thing was “Fantastic”. We hope everyone enjoyed themselves. As a token of our appreciation for coming out, each attendee got an etched whisky tumbler and some stimulating reading on Hwyl. More phones recorded away as the cars left for the evening. It was interesting to see these amazing cars alongside the taxis and buildings of downtown. It was a lot of fun and we’ll definitely do it again. We will do another event next month. Excited to announce the first member event at Bare Bones restaurant in DTR on June 8th, 2017. Looking forward to getting a group of people together to introduce them to Hywl Auto Club, and some really good food. Hywl Auto Club has taken a long time to come to fruition. I've loved cars since I was a small boy making dashboards out of cardboard boxes and tubes so I could "drive" from the back seat of the family car. This idea has been percolating in my mind for years, and the time is right. Raleigh and the surrounding areas are growing at an amazing rate. Hwyl is a new way to enjoy the performance car lifestyle. A changing garage of cars and a calendar of amazing experiences to go with it. Where did the name come from? I wanted something that would reflect my Welsh heritage and culture, and somehow capture the essence of a group of people with a stirring passion. Hwyl is a Welsh word with no direct English translation, but if you've been lucky enough to be in a crowd at a sporting event when the fans lift the team and the team is carried by the collective emotion of the crowd, that's Hwyl. Stanley Cup Game 7 for the Hurricanes, or Wales v England in the Rugby World Cup. Hwyl is passion. I hope Hwyl resonates with you, and you want to be a part of it. We want all our members to feel like they belong to something special, and we'll create amazing experiences every year to make unforgettable memories, and give you the opportunity to drive the world's finest cars.